In Biologically Inspired Design, engineers use biology as a source of ideas for solving engineering problems. However, locating relevant literature is difficult due to vocabulary differences and lack of domain knowledge. 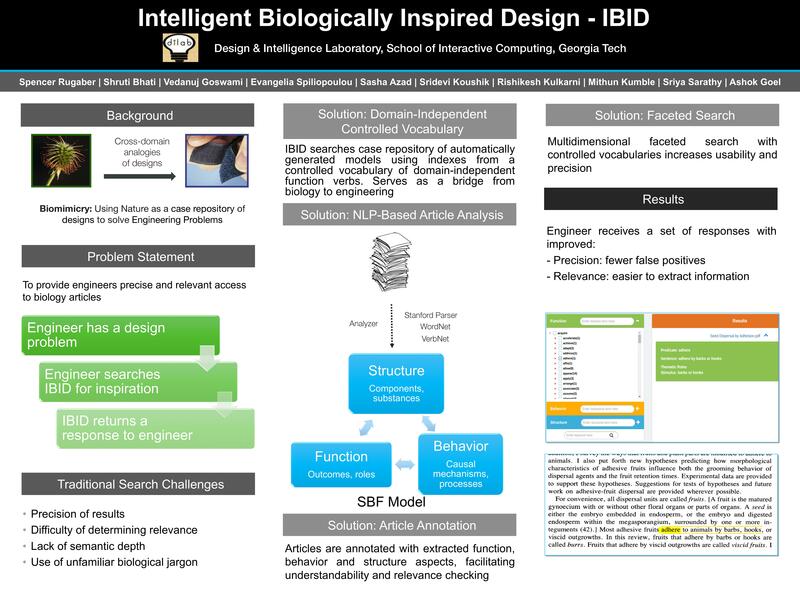 IBID is an intelligent search mechanism that uses a functional taxonomy to direct search and a formal modeling notation for annotating relevant search targets. Rugaber, S., Bhati,S., Goswami V., Spiliopoulou E., Azad S., Koushik S., Kulkarni R., Kumble M., Sarathy S. Goel, A. (2016) Knowledge Extraction and Annotation for Cross-Domain Textual Case Based Reasoning in Biologically Inspired Design. International Conference On Case-Based Reasoning, 2016. Extracting biological information from full-length papers – Biorat Biological research assistant.